I was recently able to sit down with Robert Burton, Founder and Managing Director of Preparedex, LLC. 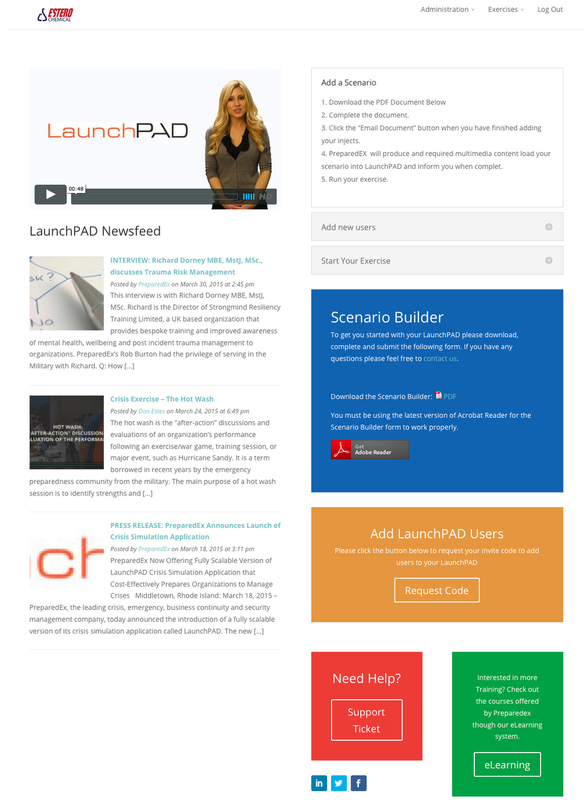 The company recently launched a virtual exercise delivery platform called LaunchPAD. There are very limited technology options to support preparedness exercises, so I was very excited to learn more about LaunchPAD, especially given my background putting together large-scale exercises for almost four years. LaunchPAD hones in on a very important issue, geographically distributed exercises that are hard to coordinate and execute. With this in mind, they have developed LaunchPAD with a "virtual" focus in mind. The platform will deliver a pre-developed scenario (along with appropriate injects and events) to a virtual audience anywhere in the world. In this way, various distributed teams can work together toward the common goal(s) of the preparedness exercise. This can be more cost-effective for each exercise and be more realistic when teams are not all operating out of the same location. If you are interested in the platform, you will probably find a solution that isn't very robust, but does solve this very important problem. Also, because HSEEP is a flexible exercise design and development approach, I think this platform would likely fit within the policy doctrine for different types of drills, tabletop and functional exercises. LaunchPAD is designed to help you with both exercise delivery and running an exercise program with many exercises each year. Right now, Preparedex is focusing on building a good system rather meeting doctrinal requirements, though. This may be a plus in the long run and enhance learning and evaluation. The platform is fairly user friendly and they have some new features they want to release in the next year, including self-service for scenario and inject import and product registration/sign-up. However, because the platform just launched, it is light on native features. In the mean time, they provide a variety of exercise consulting and support services to enhance the platform. They are also planning to create an affiliate program for consultants and others that want to help market the platform and use it in their own consulting practices. In the comments below, I would interested in knowing your exercise pain points and how technology can help with exercises. Also, do you use an existing product? If so, what are its strengths and weaknesses. I also asked Robert to answer some additional background questions you might finding interesting. LaunchPAD helps organizations and governments manage their crisis, emergency, security and business continuity exercise programs. It streamlines the exercise design process and delivers highly realistic crisis scenarios to geographically dispersed teams. What/who inspired you to create LaunchPAD? We originally came up with this idea based on a client that had to complete several emergency and security exercises over a six-week period in order to receive their operating license. In 2009, Canaport LNG, a large liquefied natural gas terminal, had various regulators and public safety officials that required them to conduct a tabletop, functional and full-scale exercise prior to officially unloading the first LNG tanker. Pressure also came from the public as well as from many internal and external stakeholders. The major issue was scheduling all the different stakeholders to be at the various exercises over a short period of time. We decided to put all three exercises online and allow approved stakeholders access so they could be a part of the validation process. This is when LaunchPAD was born. Several regulators and public safety officials commented on how easy and effective it was to access LaunchPAD and see the progression of the exercises. It was at that point in time that we realized that we were onto something and decided to develop the product further. What challenges do you help your customers overcome? LaunchPAD helps in a number of areas. Scenario planning should be customized to meet a set of specific objectives during each exercise. Many organizations will use the same power point deck over and over. This might be a storm or other scenario with bulleted text and limited visuals which never engages continuants. With the LaunchPAD enhancement services (videos, audio, simulated social media and other customized visuals) participants get involved in the exercise as it’s more realistic – and challenging, as an actual crisis would be. Another benefit is that LaunchPAD stores all the scenario so it can be repurposed to get new team members up to speed or used as a reminder for current teams or individuals. 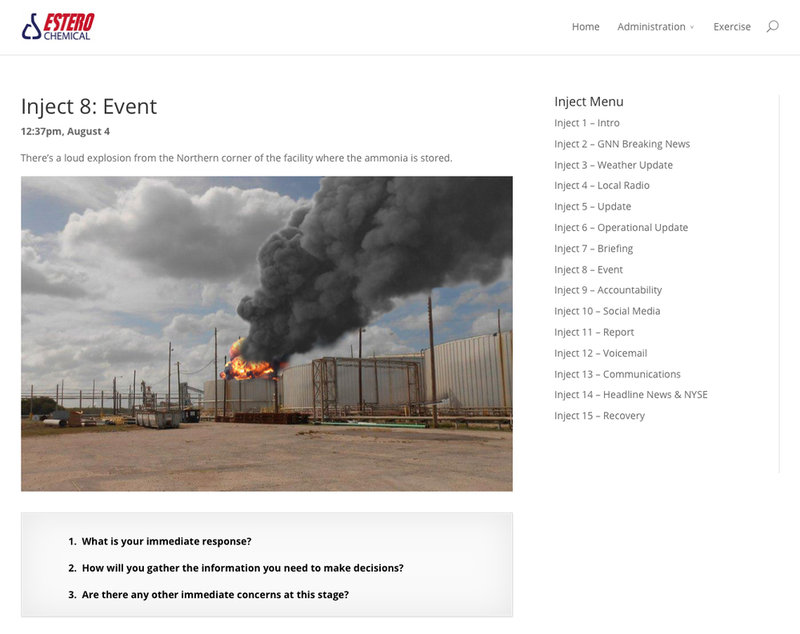 Logging team or individual responses is another feature we added to the application to allow users the ability to record their responses to the various injects that move the scenario forward and print out a PDF at the end of the session. There are many other benefits. What is next for Preparedex/LaunchPAD? We recently launched a number of eLearning courses through our online learning platform. These courses provide our clients as well as individuals the opportunity to educate their employees on an ongoing basis from anywhere in the world. This cost-effective training option provides anyone the opportunity to educate on a variety of specialist crisis, emergency, security and business continuity subjects without having to travel. We believe, and data shows, that online training and educational platforms like LaunchPAD are increasing due to the ongoing growth of the internet. We are already becoming known as the “exercise specialists” and want to continue that trend. How can people get in touch and learn more? We have two main websites: www.preparedex.net is where you will find our digital solutions and www.preparedex.com is our main corporate site.